The current outside temperature is displayed in 1°F (1°C) increments. The temperature range is between - 40°F ~ 140°F (-40°C ~ 60°C). The outside temperature on the display may not change immediately. 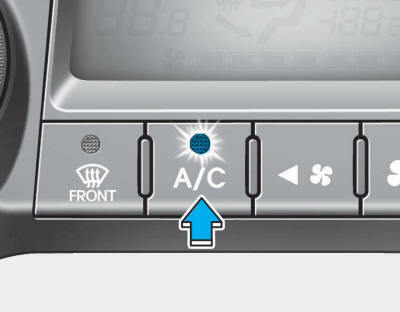 The air intake control button is used to select the outside (fresh) air position or recirculated air position. With the recirculated air position selected, air from the passenger compartment will be drawn through the ventilation system and heated or cooled according to the function selected. Prolonged operation of the heater in the recirculated air position (without air conditioning selected) may cause fogging of the windshield and side windows and the air within the passenger compartment may become stale. In addition, prolonged use of the air conditioning with the recirculated air position selected will result in excessively dry air in the passenger compartment. 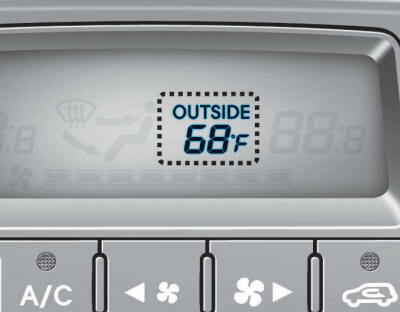 Continued use of the climate control system operation in the recirculated air position (without the air conditioning selected) may allow humidity to increase inside the vehicle which may fog the glass and obscure visibility. Do not sleep in a vehicle with the air conditioning or heating system on. It may cause serious injury or death due to a drop in the oxygen level and/or body temperature. Continued use of the climate control system operation in the recirculated air position can cause drowsiness or sleepiness, that may cause loss of vehicle control resulting in an accident. 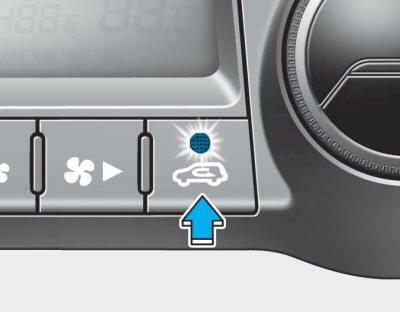 Set the air intake control to the outside (fresh) air position as much as possible while driving. The fan speed can be set to the desired speed by operating the fan speed control switches. To change the fan speed, press the ( ) the switch for higher speed, or press the ( ) switch for lower speed. To turn the fan speed control off, press the front blower OFF button. 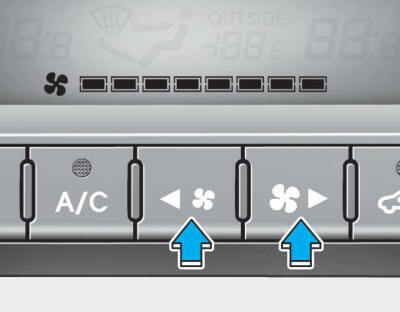 Press the A/C button to turn the air conditioning system on (indicator light will illuminate). Press the button again to turn the air conditioning system off. 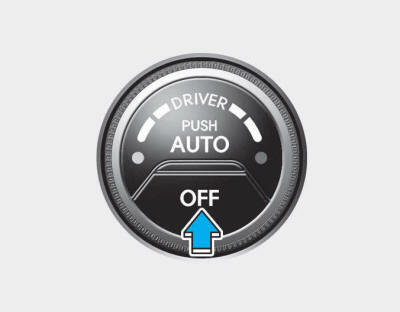 Press the OFF button to turn off the air climate control system. However, you can still operate the mode and air intake buttons as long as the ignition switch is in the ON position.